Auto Photo Editor is an all-in-one photo editor for your batch photo editing converter. Allowing you to easily convert multiple photo/image files at the click of a button. You can batch resize, rotate, stamp text on your images and convert format to others. It's easy to create batch files to automate routine photo processing/conversion tasks.Apply special effects to photos like: raise, charcoal, oil paint, gray scale, implode and more. 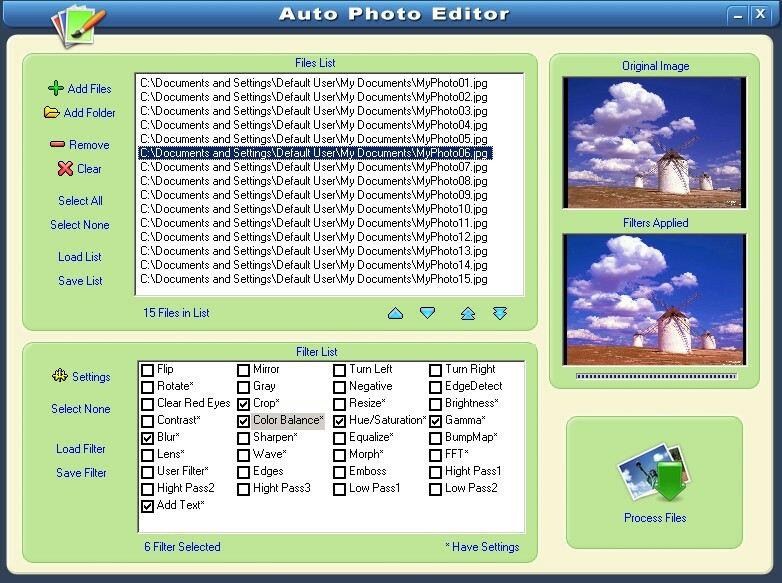 ...... Auto Photo Editor frees you from these repetitive tasks by processing hundreds, or even thousands, of photos with a single drag-and-drop. You can save images in all popular Internet formats, include tif,gif,jpg,pcx,bmp,psd,ico,cur,png,wmf,emf,tga,pxm,wbmp,jp2,j2k,dcx,crw and over 100 more graphic file formats! * Add text on photos, watermark and create thumbnails from photos. * Apply special effects to photos like: raise, charcoal, oil paint, gray scale, implode and more. * Batch Adjust Color Contrast, Brightness. * Batch Red, Green and Blue Color Adjustment. * Batch Rename Files as an integrated or independent feature in the Image Processing function. * Individually Flip, Rotate and/or Crop the Images. * Individually control Brightness,Contrast,Hue,Saturation and other Effects of the Images. It sorts out your photos. It sorts folders chronologically. Qweas is providing links to Auto Photo Editor 9.42 as a courtesy, and makes no representations regarding Auto Photo Editor or any other applications or any information related thereto. Any questions, complaints or claims regarding this application Auto Photo Editor 9.42 must be directed to the appropriate software vendor. You may click the publisher link of Auto Photo Editor on the top of this page to get more details about the vendor.